Sometimes the cells of the breast change and grow or behave in an abnormal way. This can cause the cells of breast to be non-cancerous (“benign” tumor) or cancerous (“malignant” tumor). Non-cancerous breast cells (“benign” tumors) are generally not very harmful to your health. They may cause your breast to develop certain benign breast conditions, such as cysts. Cancerous breast cells (“malignant” tumors) are very harmful to your health. When the cells become cancerous, they group together and invade healthy breast tissue and destroy it. They can also spread (or “metastasize”) to other parts of the body and spread the cancer. What is the Breast Cancer Screening Program? In partnership with the Quebec’s Ministry of Health and Social Services (MSSS) and Institut national de santé publique du Québec (INSPQ), the Public Health’s Chishaayiyuu Department of the Cree Board of Health and Social Services of James Bay organizes a Breast Cancer Screening Program every two years in Eeyou Istchee. The goal of this program is to help women above 50 – 69 years old get tested for breast cancer. How do we get screened (tested) for breast cancer? A mammogram can help detect early stages of breast cancer. During a mammogram your breast is pressed between two plates and X-ray pictures are taken of your breast tissues. In Eeyou Istchee, the mammography equipment is transported in a bus (called “Clara Bus”) or plane (called “Sophie Air) for visits to all nine communities every two years. The visits are organized by the CBHSSJB’s Public Health Department and provincial INSPQ. Sometimes, your physician may send you to Chibougamau, Val d’Or or Montreal to have a mammogram. Why is it so important to be screened? Prevention is key! Having a mammogram often allows for the detection of breast cancer at an early stage of development. An early detection allows the possibility of receiving treatment without chemotherapy – and preventing the cancer from spreading to other parts of your body. When is the Clara Bus coming next? You are automatically eligible to be screened for breast cancer. You will be receiving a letter of invitation by the CBHSSJB’s Public Health Dept. 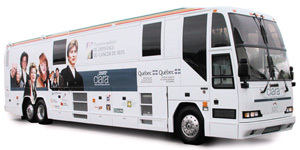 every two years to be invited for the Clara Bus/Sophie Air tour. You do not require a physician to write you a medical order. Why is it important to be screened for breast cancer at this age? Women between the age of 50-69 years old have a higher chance of developing breast cancer. Your physician will evaluate your chances of developing breast cancer at your age and see if it would be beneficial for you to be screened for breast cancer at the present moment. It is possible the physician will recommend you to be screened at a later age. If you had a previous history of breast cancer, it is recommended for you to visit your physician regularly for your own personal breast cancer screening plan. How will you get your results of the Breast Cancer Screening Program? Normal results will be mailed to your permanent mailing address. For all abnormal results, your physician will be notified and will contact you to meet in person to discuss your results. What happens when you get an abnormal result? It is very important to not worry when you hear that you received an abnormal result! It does NOT mean that you have breast cancer! It just means that you have to undergo some more tests to make sure that it is NOT breast cancer. The mammogram machine does not produce perfect x-ray images, however it is the most cost-effective and least harmful test compared to other medical technology for breast cancer screening purposes at the moment. About 10% of women that had a mammogram with the Quebec’s Breast Cancer Screening Program have had an abnormal result, but in most cases, tests done afterwards showed that it was not cancer in the end. Your doctor will receive instructions by the radiologist who read your mammogram’s results, who will provide you the next steps for additional testing. It is very important to be followed by your physician and follow their instructions so they can work with you to ensure that you do not have breast cancer. What are the advantages, disadvantages and limitations of being screened for breast cancer? A mammogram is an X-ray, which emits radiation. Periods of waiting and anxiety when additional examinations are required . Overdiagnosis is the discovery of a cancer that would never have been detected without screening. It can happen that a woman receives a diagnosis for cancer that would never have had an effect on her health or consequences on her life – like a cancer that develops very slowly or a benign cancer. In comparing 1,000 women aged 50 to 69 who participate in the screening program every 2 years for 20 years to 1,000 who do not participate, several differences are apparent.